Is legalizing drugs a good choice? 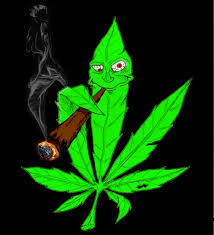 A growing movement in the country is the legalization of marijuana. Recently, my home state of California became the largest state to legalize recreational marijuana. Polls show that about 60% of americans support nationwide legalization, and more and more states are considering legalizing recreational marijuana. But looking beyond this trend one can see a larger trend on the horizon, the legalization or decriminalization of all or most drugs. It seems safe to say now that the modern “drug war” started under the Reagan administration has been a failure. Just look at the heroin epidemic as an example, over the past 15 years the number of deaths from heroin overdose has increased from about 2,000 in 2001, to upwards of 10,000 in 2014. The goal of the drug war was to keep people from doing drugs, but this statistic alone shows that that hasn’t happened. Also the drug war hasn’t made it any harder to obtain drugs, the percent of 12th grade students who reported having marijuana in the part year has increased from about 20% in 1991 to almost 40% in 2014. These statistics show that the drug war has not worked, but is legalization the answer to the growing danger of drugs? I wanted to find out if it was. Going in my null hypothesis was that legalization would not prevent deaths from drugs, and my alternative was that legalization would prevent deaths from drugs. I began by looking at the youth consumption rates for the two main legal drugs in this country, alcohol and tobacco. The percent of 12th graders who report having used alcohol in the past year has decreased from about 75% in 1991 to 60% in 2014. Also the percent of 12th graders who reported daily cigarette use had declined from a peak of 25% in 1997 to about 7% in 2014. So in the past 20 years youth consumption of legal drugs has declined, while youth consumption of illegal drugs such as weed has increased. Based on this it seems that legalization would not cause youth to suddenly do more drugs, in fact it seems the opposite is true, over time legal drug use among teens has fallen. It can be difficult to say for sure whether or not legalization of drugs would be beneficial for the U.S., mainly because no other country comparable to the U.S. has done anything like this, so there is no hard data to show if it works or not. But other countries such as Canada do have laws that quasi legalization. One example of this is safe injection facilities or SIF’s. These are facilities where people using heroin can go and inject their heroin safely, using sterile equipment, under the supervision of a healthcare professional, and uninhibited by the law. These SIF’s can be a peek into what legalization would look like. The goal of these facilities is to prevent overdose deaths and to make help more available to the people that want it. A meta-analysis done in 2014 of 75 relevant studies found that SIF largely accomplished their goal without increasing crime in the area. This is some of the strongest evidence yet that legalization would be better for people than the current prohibition. If these SIF were in the U.S., countless lives could have been saved from the Heroin epidemic that America currently finds itself in. Instead of criminalizing the sickness that is addiction, we should be taking proactive steps to prevent it and to keep people safe who suffer from it. And the evidence shows that SIF are a safe way to do that. Based on this evidence I reject the null hypothesis and conclude that legalization is the best way to prevent deaths from drugs and to keep people safe. But this doesn’t mean I think all drugs should be legalized tomorrow. This should be a state by state issue and it should be rolled out slowly and controlled so that nothing gets out of hand in the process. But in the long run, based on the data, people will be safer and better off if drugs are legalized. As I’m sure many of you know Penn State is playing Wisconsin this Saturday in the B1G championship game, and with a win Penn State would be in serious contention for a spot in the College Football Playoff. For those who don’t know, the college football playoff is a 4 team playoff to determine the national champion. The four teams are selected by a committee of 12 people who have experience in college football. Before I get into the science of this I want to talk about how incredible this season has been, from starting the season unranked and going 2-2 through the first four games, to now playing for the B1G championship and a spot in the playoff is incredible and I am excited to be a part of it. 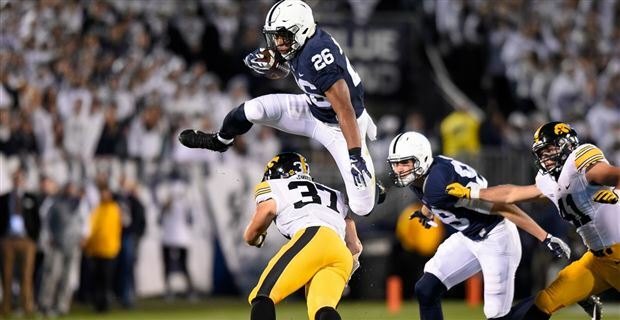 Now for the science, Penn State’s situation is this, they are currently ranked #7, with Wisconsin at #6 and Michigan at #5. They play Wisconsin on Saturday, an if they win they will obviously be ranked ahead of them. It is uncertain what will happen with PSU and Michigan, Michigan beat PSU early in the season when PSU was ravaged by injuries, and since that game PSU has looked like one of the best teams in the country, while Michigan lost to Iowa, struggled against Michigan St., and lost to Ohio State, all teams that Penn State beat. It is also unclear if PSU would make the top 4 over a team like Washington, should they win on Friday, if Washington loses and PSU wins PSU would very likely be in the playoff. With all of these scenarios and their varying affects on Penn State, I decided turn to statistics to answer my question. For this, the null hypothesis is that a PSU win alone will result in the best chances for PSU to make the payoff, the alternative is that Penn State must win and have another top 5 team lose to have the best chance at making the playoff. I personally believe the alternative is true but I will let statistics answer that for me. To get these statistics and probabilities I went to a website called fivethirtyeight.com which specializes in applying statistics to sports and other aspects of life. Specifically I went to their College Football Playoff section. First I found the chance PSU has at the playoff if they win and all other top 5 teams win as well. According to fivethirtyeight, if PSU wins along with all other top 5 teams, Penn State’s chances of making the playoff are 13%. If Penn State wins and all top 5 teams lose, PSU’s chances jump to 92%, however this situation is highly unlikely. The most likely scenario that gives Penn state a more than 50% chance at the playoff is if Penn State wins and Washington loses, this would put Penn States chances at the playoffs at 66%. Based in this information I must reject the null and conclude that a Penn state win combined with one or more top 5 loses will give Penn State the best chance at the College Football playoff. Recently the U.S government has approved phase three trials for determining if MDMA, otherwise known as ecstasy of molly, is helpful in the treatment of PTSD. The FDA approved this trial based on the successful results of many smaller trials, in which war veterans, along with others who had experienced post traumatic stress, would take MDMA along with therapy in an effort to help ease the affects of the PTSD. Many in the studies said that MDMA was the first thing that had worked for them after years of trying countless pills and natural remedies. 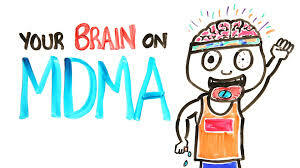 MDMA works by causing your brain to release chemicals that evoke feelings of well being, love and trust, MDMA also subduing fear and negative memories that can hinder recovery. the thinking is that this drug makes it easier for patients to confront their causes of PTSD and cope with them head on, instead of being overpowered my the negative memories it invokes. After reading this I was a bit skeptical, but as I read more and more of these studies I am convinced that the approval for a phase 3 trial was the right thing to do, especially considering that the best treatments available for PTSD right now still do not help approximately 30-40% of people who suffer from PTSD. With that many people unable to be helped it is obvious that doctors and therapists need more options to treat these people. Many doctors and politicians will argue that MDMA shouldn’t be used because it can be addicting and have the possibility of abuse, but to that I ask them what prescription drug doesn’t have the possibility for abuse? Specifically pain killers, Oxycontin is one of the most addictive substances on earth and it prescribed everyday by doctors without a second thought. The fact is that all drugs come with side effects, but if the benefits, in this case helping soldiers cope with what can be a life altering disease in PTSD, outweigh the risks than an effort just be made to give people in need access to this drug in an effort to help them. Obviously I cannot do a test of my own to see if MDMA is helpful, but if I were to conduct a study The null hypothesis would be that MDMA does not help treat PTSD, while the alternative hypothesis would be that MDMA does help treat people with PTSD. This question will be answered at the conclusion of the Phase 3 trials, and if the results are good, MDMA could be prescribed to people as early at 2021. But simply based off of what I have read, and the lack of better treatment alternatives, I would reject the null hypothesis and conclude that MDMA can help treat PTSD. This past election has been one of the most polarizing and heated on record. Both sides engaged in name calling and other not so classy campaign strategies. But no matter a persons political beliefs, not many people expected the outcome that was delivered on November 8th. This is due in large part to the countless polls that were taken before the election, almost all of which projected a Clinton win. And the polls weren’t coming from the local high school stats class, these polls came from reputable sources such as the Wall Street Journal, and CBS news. 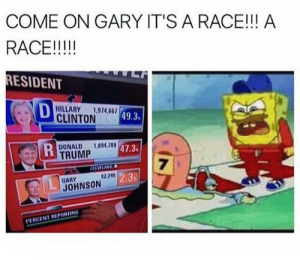 Even Fox News had Hillary winning by 4 points. These polls were constantly shown and talked about on the news and many in the political world gave trump next to no chance just days before the election, but in the end he pulled it out. So this begs the question, is there something wrong with the science of polling? Going into this my null hypothesis is that there is nothing wrong with the science of polling, while my alternative hypothesis was that their is something wrong with the science of polling. To try and answer my question I first wanted to try my hand at polling. So a couple days after the election I set out to ask people how they had voted. I ended up asking about 30 people, when I asked them I would ask them two questions, one, who did you vote for, and two, did you change your mind about your vote at anytime within two weeks of the election. The second question is to ensure that the answer I got would be the same answer that a pollster got had they called the person. of the 30 people I asked, 22 did not change their vote, and of those 22 people, 13 stated they voted for Trump, 8 said they voted for Clinton, and one said they voted for Gary Johnson. Had I taken my poll before the electio, and simply taken the data at face value, I would have correctly predicted the outcome of the presidential election. Now this is most certainly due to chance, and my poll committed just about every sampling error in the book, but nonetheless it was still right. And this raises the question of whether or not chance plays a bigger part in polling in today’s world than it did in previous decades. Many articles were written about possible reasons for why the polls were so wrong and one reason stuck out to me, many people suggested that it simply much harder to poll people accurately today than it was 20 or 30 years ago. This is in large part due to the increase in cell phones and the ability to screen calls. Almost all polling is done over the phone, and 30 years ago most families had one house phone, and a person couldn’t tell who was calling until they picked up the phone, so more people answered their phone because they had no reason not to, and thus pollsters were able to get more information. But today this is not the case, house phones are more or less a thing of the past, almost every adult has a cell phone, and they are not likely to answer it if they don’t recognize the number calling. This is due to the rise of telemarketing as well as scams. And this presents a problem for pollsters, because their predictions rely on getting reliable, well distributed information, and if they cant get that then their polls are likely to be skewed. Based on these facts, I reject the null hypothesis and conclude that there is something wrong with the science of polling, in that it has not adapted to modern times, and unless it does, people will continue to see inaccurate polls. Why is it so hard to hit a golf ball straight? I, like many others, enjoy playing a round of golf. I like the challenge of a new course and the strategy and planning that goes into every shot. But there is one thing that I can never do on a consistent basis, and that is hit the ball straight, especially on a drive. And while I am far from a professional, this is not a problem solely felt by amateurs. If you watch any major golf match on TV you are bound to see professional golfers slice their drive into the trees or hook an iron into the water, just like me, although much less often than I. In fact, according to this data, and my own calculations, the average professional golfer only hit the fairway off the tee 61% of the time. From a casual onlooker, hitting the fairway wouldn’t seem like a very hard task to accomplish. Fairways are usually fairly wide and simply aiming the golf ball to land somewhere on the fairway doesn’t seem that difficult, but the data shows that it is in fact a very hard task, even for the professionals. So why is it so hard to hit the golf ball straight? The answer boils down to there factors, where the club face contacts the ball, the angle of the club face at contact, and the swing itself. To hit a ball perfectly straight all there of these things must be perfect, but that is much easier said then done. When hitting the driver, there is a spot in the middle of the club face referred to as the sweet spot, this is the spot that will generate the most power when struck against the ball. And it is this spot that all golfers try to hit the ball with. But the problem is that the typical sweet spot on a driver is approximately a quarter of an inch wide and a golf ball is only 1.68 inches in diameter. This image shows the club face of an average driver. Drivers can differ slightly in size and shape but the sweet spot concept remains the same. Inside the red circle represents the sweet spot. That is the part of the club that must strike the ball to achieve maximum distance and to keep the ball straight. But this isn’t the only factor in hitting the ball straight. Another, equally as important factor is the angle of the club face upon impact. 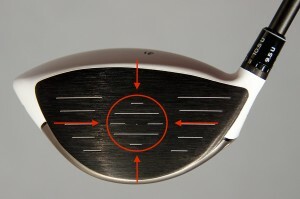 This image shows the three ways a club face can impact a the golf ball. On the left, a closed club face is depicted, this can happen when one over rotates their wrists on the swing, causing the face to close when it impacts the ball. For a right hand golfer, this will cause the ball to go left. On the right, an open club face is shown, this can happen when one under rotates their wrists during the swing. For a right handed golfer, this will cause the ball to go right. In the center a square club face is shown, this is how the club face should look when it impacts the golf ball. This, combined with hitting the ball on the sweet spot, will help greatly in hitting the ball straight. But there is another hugely important factor in hitting the ball straight, the swing. 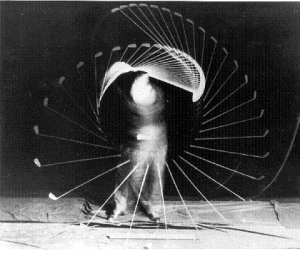 This is a strobe picture of Bobby Jones’ swing. Bobby Jones was one of the best golfers of his era (1920’s – 1930’s). He won many major tournaments and helped found the Masters golf tournament. Although this picture is more then 70 years old, the golf swing hasn’t changed much, and this picture still represents an excellent swing. This is where physics plays a huge part in hitting the ball straight. There are numerous parts to a swing and all must be perfect to hit the ball straight, but for this blog we’ll focus on the wrists. This picture shows various points of a swing, and the corresponding wrist position. At point 1, the wrists are straight, at point 2 once the back swing begins, the wrists begin to move back until they reach the 90 degree angle shown at point 3. The wrists stay this way until somewhere between point 4 and 5. 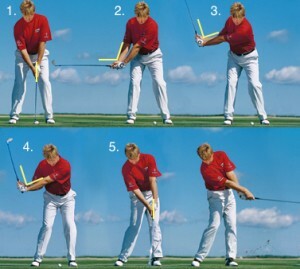 Between 4 and 5 the wrists must unlock and become straight again as the club face makes contact with the ball. The hard part is gauging when to unlock the wrists so that they will become straight at the right time. The exact point at which to unlock the wrists to achieve the best contact can be found using physics. This website breaks the whole thing down step by step using math and physics that is far beyond me. 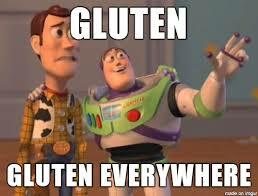 But I will try to summarize it as best I can. First one must draw a picture of what is happening in the swing and assign variables to the different points of the drawing. 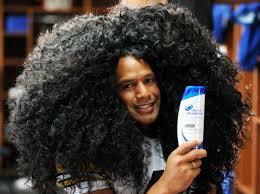 That looks something like this. 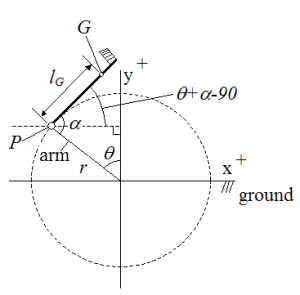 Then, after finding all the variables and setting up numerous equations, the people at www.real-world-physics-problems.com, found that the optimal angle to release your wrists is between 55 and 60 degrees. This is shown approximately where the white line is in this picture. We have covered three very important aspects of hitting a golf ball straight, where the ball makes contact with the club face, the angle of the club when contact is made, and the point at which to release your wrists. And with an average swing speed of 93 miles per hour, the average golfer has less than a second to ensure all three aspects are perfect, and if one is even slightly off, the ball will not go straight. And thus, this is why it is hard to hit a golf ball straight, there are simply to many parts in the swing and too little time during the swing to ensure that everything is perfect every time. Gambling has been around since the dawn of mankind. Whether it was ancient romans rolling dice in the streets or guy in his basement deciding whether or not to take the Steelers at -7.5 over the Eagles, most everyone has gambled at least once in their lives. So what is it, why do people gamble? According to google.com, gambling is defined as “play games for a chance of money”. One does not necessarily have to play a game to gamble however, for instance a person can bet on the outcome of a football game or a horse race. It is logical that those who gamble must get some satisfaction out of it, or else they would not gamble. And this satisfaction is not likely to come solely from winning the money or prize. This is because, according to data from online gambling sites gathered by the Wall Street Journal, on any given day a person only has a 30% chance of winning money. Many gamblers likely wouldn’t know this going in however, because casinos and gambling sites try to keep this data hidden so as not to deter potential gamblers. Say a man goes to a casino to gamble, he sits down at the slot machine he plays 10 times, this slot machine cost $1 to play and pays out $2 for every win, out of those 10 times he wins only 3 times, coming away losing $6. If this mans only satisfaction came from winning money, he would leave unsatisfied and would likely not gamble again. But this not the case in reality. Many people continue to gamble despite losing money, so what is their motivation, and what satisfaction do they get out of gambling? The answer can be found in the brain. Studies have shown that when people gamble, the brain’s reward system becomes activated in a way that is similar to a person taking a drug. 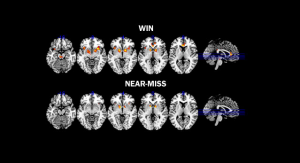 In one study participants were placed in a fMRI scanner, which measures brain activity by detecting changes in blood flow, and played simulated gambling games. The results showed increased activity in the ventral striatum, which is the brain’s reward center. This image shows the brain activity of a person who won a game of chance vs. someone who almost won the same game. The picture shows that even when people lose, simply playing the game stimulates the brain nearly as much as winning the game. This is the satisfaction that people get from gambling, and this is people’s motivation to keep gambling. When a person gambles, dopamine is released into the body (Linnet et al., 2011; Joutsa et al., 2012) this causes pleasure in a similar way that a drug such as cocaine might. A person doesn’t even have to win to feel excitement and stimulation, that comes simply from the act of gambling. Thus, people continue to gamble in the face of losses because of the stimulation they get from taking the risk. The take away from this is that people gamble, and continue to gamble, simply because it feels good, gambling is a high of sorts, and people gamble to feel that high. 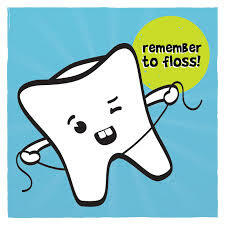 But this can become a problem if not controlled. People can become addicted to gambling the same way they can become addicted to alcohol or drugs. Their are countless stories of people who lost everything because of their gambling problem. So, while gambling can be fun and exciting, one must be very careful, because the same thing that makes us want to gamble can cause us to become addicted to it. 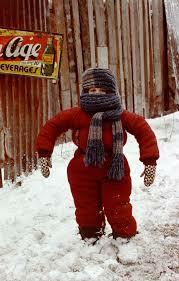 Hi, my name is Sean and I’m from Fresno, California. You’ve probably never heard of this place and really the only thing notable about it is that the quarterback for the oakland Raiders graduated from Fresno State. But other than that its nothing special. I came to Penn State to study in the Smeal College of Business and major in Finance. I am taking this course mainly because in the description it said that this course was not intended for Science majors, but it would still fulfill my GenEd requirement for science. That sounded like the perfect class for me so I signed up for it. 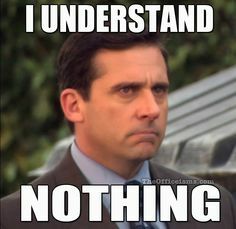 I am not planning to be a science major because of my junior year honors chemistry class. Going into this class I was interested in chemistry because I wanted to learn how different elements reacted with each other. I can remember making dry ice bombs with my friends, kind of like this, and wondering why it worked the way it did (it blows up at around 1:19 if you’re interested). Or when my biology teacher lit his table on fire and it just went out peacefully without catching the building on fire. These were the things that had me interested in science. But once honors chemistry started my interest in chemistry quickly faded. My teacher told us that in order to get a good grade in the class we would essentially have to get a good grade on every test and lab for the whole year. And once she started teaching, chemistry went from learning how things interact with each other to simply doing boring and complex math problems. I felt like I had no idea what was going on every time I stepped into class. I barely pulled out a B in this class and the experience finalized my decision to major in Finance. I still remain interested in science and I realize its vast importance in today’s society, but I no longer have any interest in pursuing it as a career. This entry was posted in Uncategorized on August 31, 2016 by Sean Patrick Hickey.